The Beast of the East has claimed PCGamesN, but the Weekend Esc crew have a kettle, a burning need to share PC gaming news, and a flagrant disregard for their own safety. In today’s show, Rich and Alice talk Overwatch’s new hero Brigitte, Hearthstone’s forthcoming tournament mode, and the strange case of Chrono Trigger on PC. 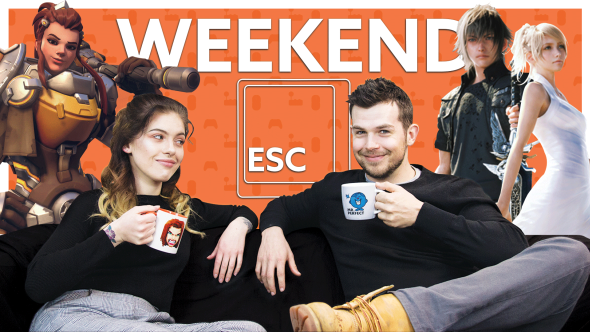 Watch more of the Weekend Esc, our weekly PC gaming show. Elsewhere, the team decide on the top five Final Fantasy games, a non-controversial subject that nobody has fallen out over ever. Though the process might be painful, the results are worth it: a set of classic JRPGs you can now play on a desktop without resorting to emulators. It is a less straightforward story for Chrono Trigger, which has now, without warning, arrived on PC feeling an awful lot like a mobile game. Meanwhile, Final Fantasy XV’s Windows Edition is almost too PC: there is no graphics card capable of running it at 4K on the highest settings. This week’s giveaway is a winter weather special: a Fishing: Barents Sea beanie, a Warframe scarf, and – because exercise keeps you warm – an Alphacool bouncy ball. To enter, just complete one or more of the actions in the widget below. The more you complete, the higher your chances of bagging the prize. We do need an email address, but only to contact you if you win. Beyond that, we ask only that you watch the show and stay toasty.